The LNS-18 is a general purpose synthesizer that exhibits outstanding phase noise performance. Its low noise oscillators generate a very flexible frequency up to 18 GHz. 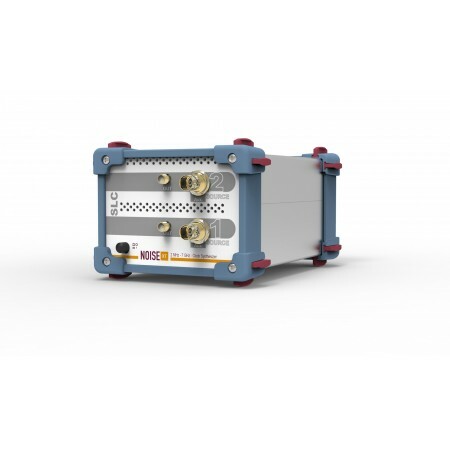 With -132 dBc/Hz at 10 GHz carrier and 20 kHz offset, the LNS-18 is one of the lowest phase noise synthesizer that can help you challenge tomorrow’s requirements for Space and Defense applications. Optional level control, Pulse modulation, GPIB and low frequency extension down to 8 MHz using ultra low noise frequency dividers (-165 dBc/Hz) are also available in addition to the Ethernet and EFC input. Why the LNS Series ? Lowest noise floor : -132 dBc/Hz @10 GHz ! Notre engagement est de vous accompagner au-delà de la simple fourniture de matériel ou de logiciels issus de notre catalogue. Nous nous engageons à vous assister dès les premiers contacts et ainsi vous proposer une gamme de prestation adaptée à la réalisation de vos projets.